Back in June 2013, a G8 meeting was imminent, announced by a flood of editorial coverage, political declarations and alter-globalization protests advocating the rights of the “Rest” over the “West”. The G8 was to take place in London—under UK presidency for the first time since Gleneagles in 2005— and spoke particularly to a country that had seen globalization raise all sorts of questions in the previous year, from multinationals’ tax avoidance scandals to the murder of a British soldier in the streets of London that revived anti-immigration sentiments. 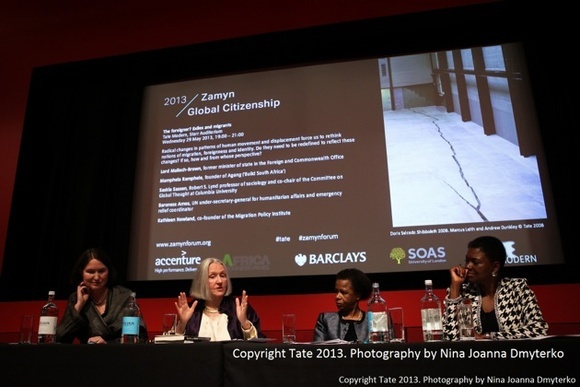 Yet this time around, there was novelty among the predictable: personalities such as Paul Collier, David Miliband, Mary Robinson and Baroness Amos came together at Tate Modern to debate various facets of “global citizenship” as part of a two-week long ‘Cultural Forum’. Highlights included Nigerian novelist Ben Okri’s eloquent argument in favour of (re)inventing a language of globalization that would more accurately reflect current trends and identities; and Unilever CEO Paul Polman’s compelling presentation of his grand vision for sustainable businesses. The Global Journal speaks to the man behind the Cultural Forum and founder of Zamyn, Michael Aminian. His organisation has a powerful vision for an alternative to Davos: a cultural forum that aims to reconcile globalization with its true agents, the citizens of the world. Zamyn means ‘ground’ in Farsi. What is Zamyn and how does its name relate to its purpose? Zamyn is a sociocultural analytical organisation that was created by myself with a group of artists. We actively started in 2004, but the idea was there long before—it got delayed because of 09.11, as the focus then was on other issues. We wanted to give the organization a name that was truly global, bottom-up, and that acknowledged of the role of the individual in globalization. ‘Zamyn’ means ‘ground’ in both Farsi and Urdu, and we felt it reflected our aim of opening up the discussion of globalization to a wider population. While the cultural side of globalization is much discussed in academic circles, artists are the ambassadors of culture, and that is why Zamyn is structured around them. And, while businesses are also crucial and need to be aware that they are shifting the way culture shapes and reshapes itself, those who can explain this change are the academics, artists and writers. Therefore, Zamyn is not a consultancy but an analytical agency, which works with these individuals to analyse, document and define how culture is shaped by globalization and vice versa. What personal journey led you to found the organisation? As you can tell from my surname, I was born in Iran, but my family left the country in 1962. We stayed in Germany and France first, and ended up in UK. My comfort zone had been torn: I came from a totally alienated part of the world, and had to switch from a Middle-Eastern to a European culture. I was leading something of a double life between my parents’ traditional mentality and my British life. Those of us who lived like that at the time were like the guinea pigs of globalization. Like a lot of second-generation immigrants, I faced the difficult responsibility as a child of fulfilling the hopes of my parents. I ended up studying biochemistry, yet I had no interest in continuing with research, nor in working with the family agricultural business, as at that point, my identity had shifted away from the traditional Iranian way of life. I spent about 10-15 years writing for both the Mail on Sunday and for Teheran Times, and continued to wonder where my loyalty lied. Psychoanalysis, in particular the Lacanian School, gave me the right vocabulary through which to understand my identity. I therefore began having analysis, which in the Middle-Eastern culture is unusual—people would ask me whether there was something wrong with me and I would say: ‘I am just a protégé of globalization, I am puzzled by my identity.’ I think psychoanalysis gave me a vision, an idea of the way forward. Then, I was diagnosed with cancer, and that was a wake-up call. I had to grow up at that point and ask myself: what am I really going to deliver? I was an art collector, but I knew I was not an artist, nor a writer. However, what I did have was this experience of a global existence. Globalization was very much coming to the forefront at the time and, while it belonged to the individual, the public, economic globalization threatened to highjack it. How could we come up with a formula that prevented this from happening? We decided to create an organisation that allows the individual to be heard and recognises that they are the real asset and agent of globalization. If you look at who has been invited to be part of Zamyn, they have all either written about, or lived the process of, globalization. Next came the challenge of how to communicate with the public: at the beginning, academic institutions expressed a lot of interest, because in a sense globalization was a very academic notion and academia consciously or unconsciously did not want to let go of its ownership of it. So we began with the London School of Economics in 2005, through a series of seminars about Culture and Globalization, chaired by Professor Henrietta L. Moore. It was a success from an academic perspective, but stopping there would defeat Zamyn’s purpose. We therefore decided on an intellectual cultural forum that would complement Davos’ World Economic Forum, would happen biennially and would be based in London. Historically, it is the place to be: it was the capital of colonisation, and London has to take ownership of its past to move forward. What do you believe prompted such diverse personalities such as Sir Anthony Giddens, Baroness Amos or Anish Kapoor to join Zamyn? The reason why Anish Kapoor, who is a good friend, and other theorists, analysts, artists or visionary business leaders—which is rare—were identified was because they are addressing the issue of globalization through their work. Also, I made sure that they knew that the Zamyn platform would function at the most rigorous level. These people have spent years unveiling their own theory, perfecting their work whether it is a book, a lecture, or an installation. We cannot allow the standard of an Anish Kapoor or a Steve McQueen to drop, and many organisations that approach them do not uphold this standard. Zamyn aims at « challenging powerful categories » of centre and periphery, and creating a « shift in social attitudes ». Why is a change in consciousness so important? How does the arts contribute to it? The West needs to develop a different approach to the so-called ‘peripheral’, ‘developing’ regions of the world. It is archaic and patronising, and unhelpful on a cultural, economic and political level. Given the current crisis in the West, it is even farcical from an economic point of view. The only way forward is by the inclusion of the rest of the world. Where Zamyn, the analysts and the artists come in is in the rephrasing, the reshaping of identity, taking it out of the intellectual space to a grass-roots level. When someone gets murdered for political or religious reasons, the attacker’s motivation sometimes stems from being degraded by those who are dominant. Zamyn aims to interrogate this relationship of dominance and rebellion. More recently, we have started using the term “new emerging countries”, which is quite interesting linguistically: some consider this denomination an honour, but I feel it is a misrepresentation. Indeed, from a cultural point of view, how can they be “new” or “emerging”? They are built upon timeless civilizations! Once again, it fits from an economic point of view, it is another way of saying they are “fertile ground” for business from the West to move in. And, when that sort of approach is taken, it breeds bad feelings, the wrong flavour of working together. We do not believe in that at all here at Zamyn. The Cultural Forum 2013 was on the theme of « Global Citizenship » in the lead up to the G8 summit in Ireland. Why is global citizenship important when thinking about the G-s? The original theme was going to be migration and immigration. Migration is often a very healthy process, but one that the majority of the West does not understand. And when they do, they only handpick the aspects of it that they see as beneficial. However, as it was a difficult sell at the beginning, we decided to translate it into something softer, namely global citizenship. Zamyn’s Chair, Sir Mark Moody-Stuart, made some excellent contributions at the final “Lessons for the G8” event, available online on the Zamyn Forum website. The G8 as a concept is defunct: eight leaders trying to run the world is a formula that does not fit in an era of globalization. To paraphrase our panellist Ian Bremmer, the world is more of a « G-zero » at the moment, rather than a G8, 7 or 20. One suggestion for the G8 that came out of the various debates is that they should at the very least try to include the rest of society, perhaps as through a sort of think tank, rather than keep a top-down, elitist form of decision-making. What would be for you a criterion of success in the coming years? It is a tough question, because I have such high standards. After eight years of psychoanalysis, I believe you never really arrive at an end product! However, if we can put on the map a real intellectual cultural forum, that truly embraces the process of globalization and allows the public to take an ownership of it, if we achieve 50% of that, I will regard it to be successful.